Ambati Rayadu's form is a big worry for Team India going into the World Cup. In the current year 2019, Rayadu has scored 245 runs at an average of 35 with only one fifty. The figures are nothing extraordinary for a batsman who was expected to occupy the crucial No 4 position for India in the World Cup not so long ago. Now with the sudden dip in Rayadu’s batting form, India has to start all over again in search of a No 4 batsman with the World Cup just 3 matches away. It is a pity that every time he steps onto a cricket field, Rayadu has to play for his place. Rayadu is not the only one who is out of form this year. Shikhar Dhawan’s form is even worse with 264 runs in 10 innings at an average of 29 with 2 fifties. Rohit Sharma too, is not in the best of form. The saving grace for India has been the exceptional form of MS Dhoni who has scored 301 runs in 7 completed innings at an incredible average of 100 with 4 fifties. 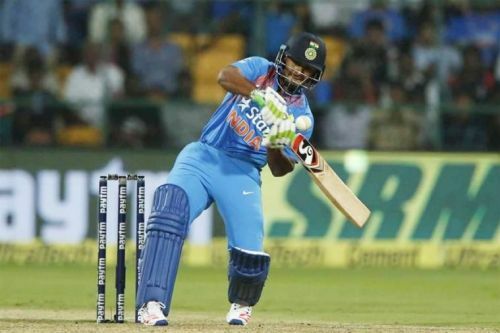 Kedar Jadhav is not far behind with 210 runs at an average of 70 with 2 fifties. Then there is King Kohli who is just short of 39 to reach the 500 run mark this year. The difference between Dhawan and Rayadu is that in the past Dhawan has proved to be a proven match-winner once he got into his rhythm whereas Rayadu has been more of a steady batsman who could do his bit for the success of the team. Besides, after his home turf, Dhawan has scored more ODI runs (976) in England and Wales than in any other place. Coming back to Ambati Rayadu, he might get another 3 matches to cement his place in the World Cup squad. But the continuous failures of Rayadu has given hope for 3 players to break into the Playing XI for the World Cup. In cricket, as in life, one man’s loss is another man’s gain. Though players like Ajinkya Rahane have an outside chance of making it to the World Cup squad, one can only feel it is too late for such players to make a late comeback. Hence, those 3 players will have to come from the current squad. Rishabh Pant has so far played in only 3 ODIs for India. But he has the talent to last the distance and he is a player for the future. Pant could achieve a lot in white ball cricket if he shows the same amount of patience as he has shown in Test cricket. He has to be selective in his shot selection and has to restrain himself from going for risky shots at the beginning of his innings. Pant’s natural attacking instincts are more suited for ODIs than for Tests. Plus, in the current team, he is the only left-hand option in the middle-order. Moreover, it seems the selectors have already made up their mind to prefer Rishabh Pant ahead of Dinesh Karthik for the World Cup. Though a different format, Pant was more successful than Dinesh Karthik in the Test series in England last year. Ambati Rayadu’s poor form would definitely benefit Rishabh Pant to find a place in the playing XI for the World Cup. If not anything, it should consolidate Pant’s place in the squad.